Spring has been a little reluctant to join us this year, but the calendar says it's time for warmer days. Spring always makes me think of lemon. Perhaps it is the sunny color of lemons that makes me favor all things lemon this time of year. 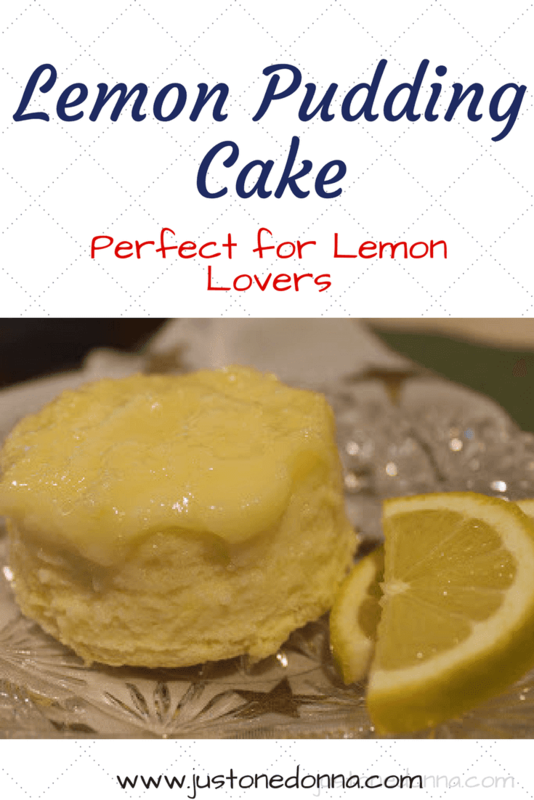 Truth be told, lemon has always been a favorite flavor and these Lemon Pudding Cakes have become a favorite way for me to indulge my love of all things lemon. Originally, I found this recipe on the Williams-Sonoma recipe site. Their recipe for individual lemon pudding cakes reminded me of how much I like little individual cakes, whether cupcakes or chocolate lava cakes. It's fun to make a special cake for each person and I'm always a fan of the forced portion control that results as well. This is a straightforward recipe. The ingredients are simple, and like me, you may already have them in your kitchen. Flour, salt, egg, lemon, milk, and sugar. Don't you love it when you don't need to run to the grocery store to make something yummy? I always like to read the reviews of recipes online because sometimes there are tips and other times the comments are just plain entertaining. The first reviewer gave this recipe five out of five stars saying it was perfect. That was followed by the second reviewer who gave it one star, saying it was "an absolute waste of time and ingredients". Well, those conflicting reviews made me definitely want to try this recipe to see which it was, a five out of five keeper recipe or a complete bomb. Preheat the oven to 350 degrees F and place eight half-cup ramekins in a 13x9-inch baking dish filled with four cups of water. The water level will be halfway up the outside of the ramekins. Next, beat together the egg yolks with 3/4 cup of granulated sugar, beating for 3 minutes with your electric mixer until the mixture is pale yellow and thick. It will look delightful. While the eggs are beating, mix together the 1/2 cup of flour and the 1/4 teaspoon of salt and set that mixture aside. Zest one lemon and squeeze 1/3 cup of lemon juice from two lemons. Stir the flour mixture into the eggs and sugar, making a very thick batter. Beat the batter on medium speed for two minutes. The batter will be very thick and lumpy. Add the lemon zest, milk and lemon juice, stirring gently. Using a silicone spatula to do the stirring will help you loosen the thick, lumpy batter from the bottom and sides of the mixing bowl. Next, in a separate glass bowl, beat the egg whites until thick and foamy and add 1/4 cup of granulated sugar. Continue beating until the whites form soft peaks. Next, fold the whites into the egg and lemon batter. Using a silicone spatula, fold about 1/4 of the egg whites into the batter to distribute the batter and lighten it a bit. Then fold in the rest of the egg whites, gently, but completely. Use a scoop to distribute the batter into the eight ramekins evenly. Then place your pan on the center rack of the oven to bake for approximately 40 minutes. You'll know the pudding cakes are completely cooked when they are browned, puffed up high above the rim of the ramekins and some may be cracked. Using different types of ramekins may result in the cakes cooking differently. Can You See the Different Results with Different Ramekins? You'll be impatient to taste them because they look delicious and smell even better, but you'll want to cool them in the water bath for 15 to 20 minutes. You'll see that they will settle as they cool. I love to dig into these cakes while still warm and the consistency is light and delicate. The flavor is sweet and lemony, just what I like is a spring dessert. In my humble opinion, this recipe is a delicious way to showcase the flavor of lemons. These lemon pudding cakes are easy to make and are a tasty treat. For all of us lemon lovers, this recipe deserves a five out of five stars. I call it a keeper. After you let the lemon pudding cakes cool to room temperature you'll be able to turn them out onto a plate after running a knife around the edge of the cake and carefully coaxing it loose. This results in a prettier presentation with the pudding covering the top of the cake. You can either serve them straight from the ramekin or turned out onto a pretty plate. You can get the original lemon pudding cake recipe by following the Williams-Sonoma link. 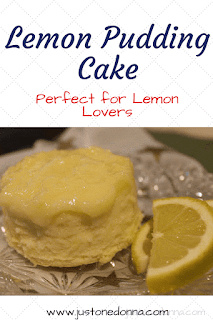 Get other recipes for lemon lovers from my Pinterest board. Before you go.....Please share this recipe on Facebook, Pinterest, Twitter, or Yum! These look scrumptious! Thanks for sharing at Meal Plan Monday! !